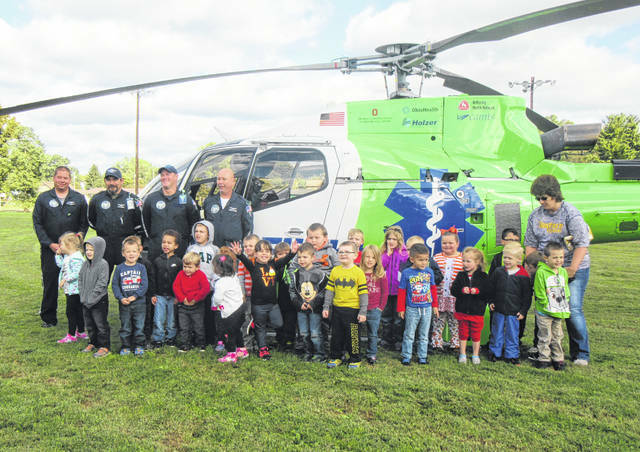 Preschool students from Carleton School are pictured with MedFlight as part of Safety Day on Friday. Cliff Thomas of the Syracuse Volunteer Fire Department talks with Carleton Preschool students about the equipment on the department’s trucks. Meigs EMS also took part in Safety Day with Carleton School, with the students able to walk through the ambulance. Some of the students were able to try on the firefighter helmets. 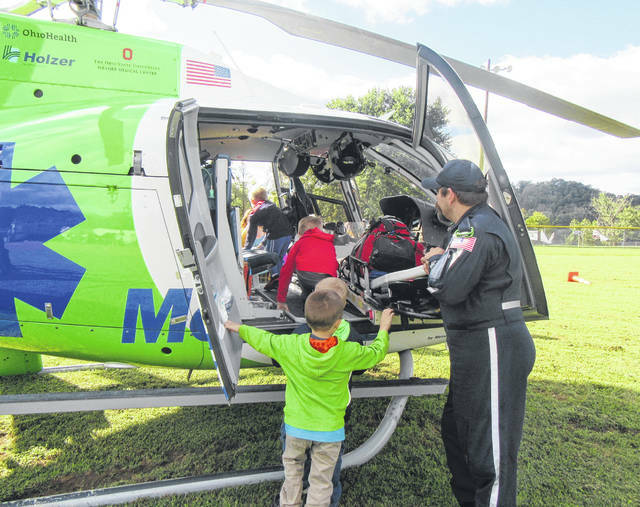 Preschool students climbed inside the MedFlight helicopter with the assistance of the flight crew. 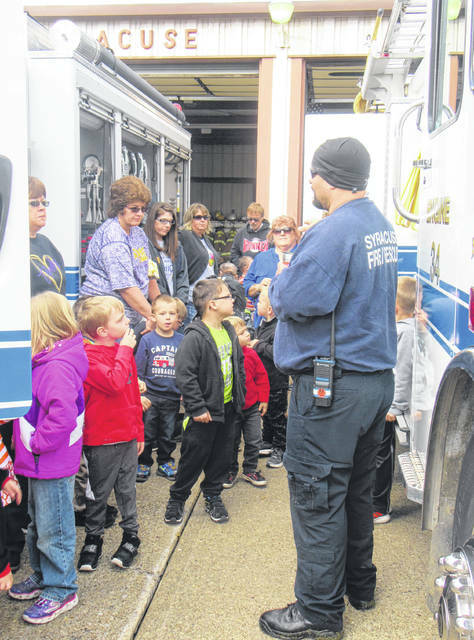 MEIGS COUNTY — As part of Fire Prevention Week, students around the county were given a lesson in fire safety, along with a visit from local emergency personnel. The National Fire Protection Association (NFPA) had the theme of “Look. Listen. Learn. Be aware – fire can happen anywhere” for Fire Prevention Week, which took place from Oct. 7-13. Visits from the local fire departments began the Friday before Fire Prevention Week with the Rutland, Middleport and Pomeroy fire departments visiting Meigs Elementary. 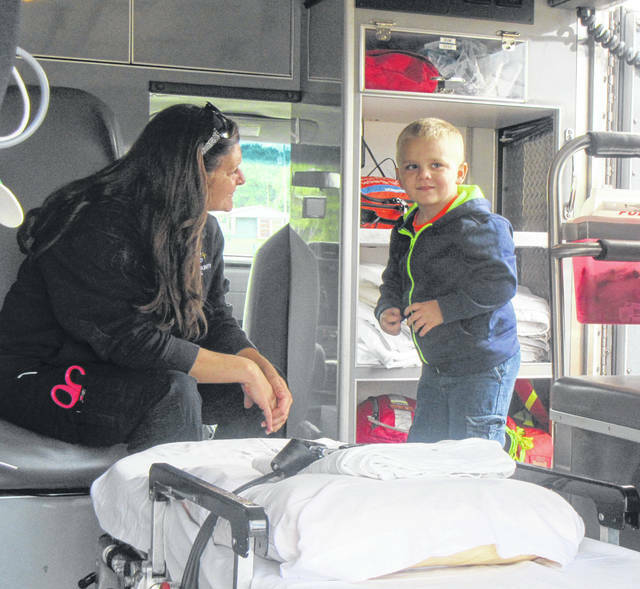 Events continued with Chester, Tuppers Plains, Olive Township and Bashan volunteer fire departments holding an event at Eastern Elementary. Racine Volunteer Fire Department visited with students at Southern Elementary, while Carleton School students took a field trip to the Syracuse Volunteer Fire Department. Carleton students were able to visit with Meigs EMS and MedFlight as part of their visit to the Syracuse Fire Department. “Look. Listen. Learn. Be aware – fire can happen anywhere.” works to remind the public that fires can and do still happen – at home, as well as other locations – and that there are basic but vitally important steps people can take to remain safe. As the official sponsor of Fire Prevention Week for more than 90 years, NFPA works with local fire departments throughout North America to promote the campaign in their communities and reaches out to the public directly to encourage everyone to take action to be safe. List of events as provided by Derek Miller of the Meigs County Fire Association. Fire Prevention Week information from the National Fire Prevention Association. 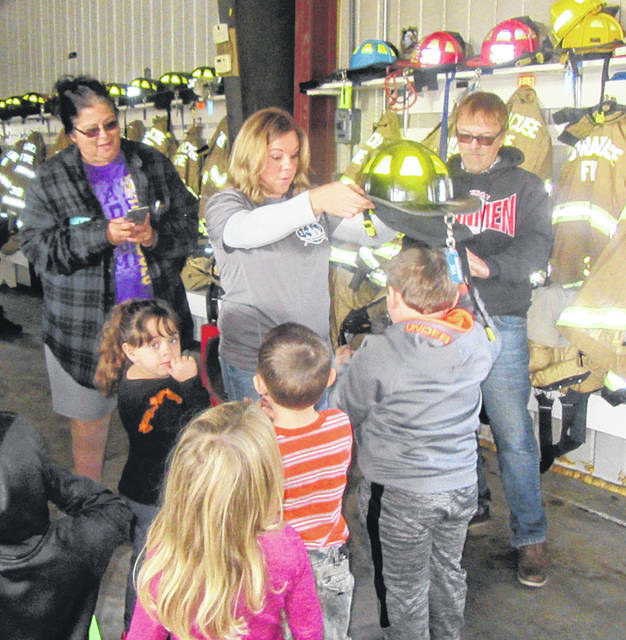 https://www.mydailysentinel.com/wp-content/uploads/sites/14/2018/10/web1_10.16-Safety-Day-1_ne2018101516465014.jpgPreschool students from Carleton School are pictured with MedFlight as part of Safety Day on Friday. https://www.mydailysentinel.com/wp-content/uploads/sites/14/2018/10/web1_10.16-Safety-Day-2_ne20181015164652812.jpgCliff Thomas of the Syracuse Volunteer Fire Department talks with Carleton Preschool students about the equipment on the department’s trucks. https://www.mydailysentinel.com/wp-content/uploads/sites/14/2018/10/web1_10.16-Safety-Day-3_ne20181015164656468.jpgMeigs EMS also took part in Safety Day with Carleton School, with the students able to walk through the ambulance. https://www.mydailysentinel.com/wp-content/uploads/sites/14/2018/10/web1_10.16-Safety-Day-4_ne20181015164659116.jpgSome of the students were able to try on the firefighter helmets. 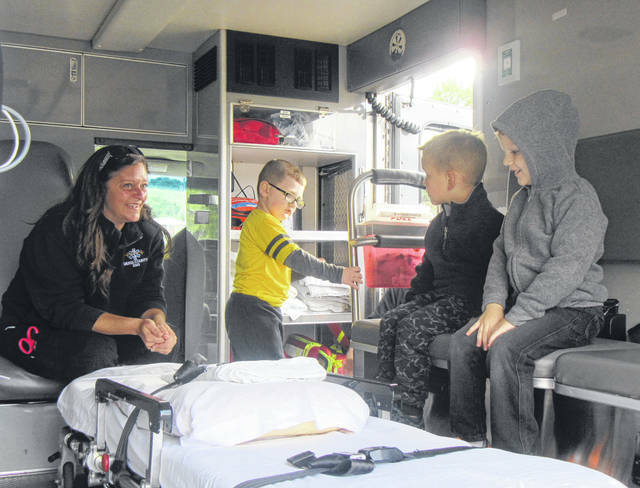 https://www.mydailysentinel.com/wp-content/uploads/sites/14/2018/10/web1_10.16-Safety-Day-5_ne2018101516471969.jpgPreschool students climbed inside the MedFlight helicopter with the assistance of the flight crew. https://www.mydailysentinel.com/wp-content/uploads/sites/14/2018/10/web1_10.16-Safety-Day-6_ne2018101516474846.jpgMeigs EMS also took part in Safety Day with Carleton School, with the students able to walk through the ambulance.